Preheat oven to 160ºC/ 140ºC fan-forced/ 400ºF. 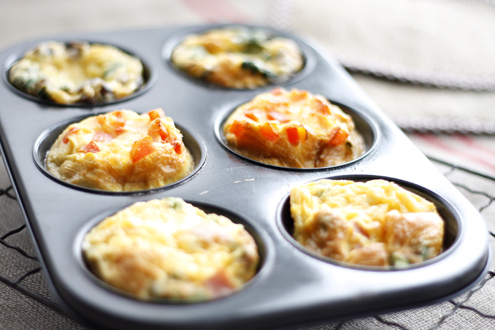 Whisk eggs and spoon into the cups of a non-stick or lightly greased muffin pan. Distribute your combination of filler ingredients amongst each muffin cup (but avoid overfilling as they’ll rise and run over the edges). Sprinkle with cheese (optional) and bake for around 10 – 12 minutes until egg is cooked through and fluffy. Serving suggestions: Toast (for carbs) or salad. I am searching for healthy, low carb recipes and I found your blog. I also love to eat eggs for breakfast. I will try your recipe. Never made it this way. Can’t wait! Regards from NJ! Great idea! I went and got some groceries right after I found this. I made mine with diced bell pepper and bits of bacon, with orange slices on the side. I just used 4 eggs for the two of us and it was a perfect amount: 3 mini cakes each. My husband was pleasantly surprised. It came out very good! Thanks for the idea. Can u make these as mini eggy cups? Has anyone tried to freeze these, then re-heat?? I made the mushroom spinach version and decided these eggy cups are the way to go for a breakfast on the run! So I experimented the second time I made these by using shredded/grated zucchini, green onion, and crushed garlic. Equally yummy!